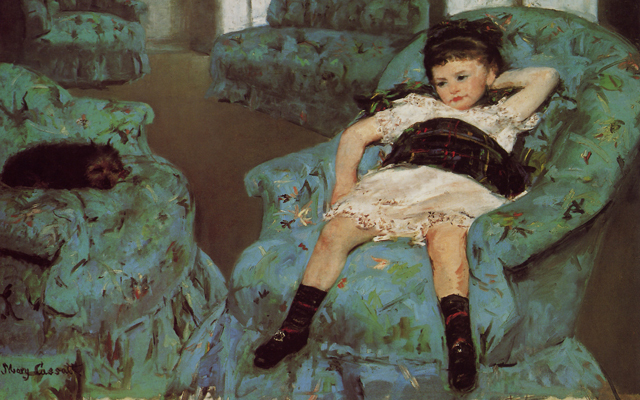 Mary Cassatt, Little Girl in a Blue Armchair, 1878. National Gallery of Art. Please welcome arts educator Anna Efanova to EdSpace. She recently participated in a KQED Education workshop where we spent a day at MoAD learning about historical representation through art and film, and later created short films at KQED about missing voices or stories in history. Anna created a film about some important female artists that she wanted to introduce to her students. From Anna Efanova: We often hear and talk about bringing technology into the classroom. KQED does exactly that by offering workshops for educators that inspire and teach them how to enhance their lessons with technology. I have been looking for other possibilities to present visuals about the artists, and here was an opportunity to learn how to use iMovie. The workshop began with an inspirational and thought provoking tour of the MOAD museum and their exhibition, COLLECTED: Stories of Acquisition and Reclamation. We explored highlights from personal collections of books, posters and other memorabilia about the culture and history of African Americans. On the second day of the workshop, we were introduced to the iMovie software and started to create our presentations. It was a first experience for me, but I found the software quite intuitive and easy to operate with the help of Matthew Williams. The whole experience of putting the images, voice and music together made me think of the relative elements of the presentation that make it interesting. I have also added text to make sure that the attention is kept in focus. With the abundance of the media around us and our students, it is to start daydreaming if there is not enough stimulation. By the end of the third day we got to see the other teachers’ projects. I was delighted to see that everyone has taken their own route to present what is closer to their teaching and student’s needs. My presentation was about Women artists. I often use images and then talk while showing the work to the students. Making a movie made me think more deeply about the structure and the overall cohesiveness of the presentation. Now, when I introduce a lesson I can use my own video as a starting point and then use the questions and conversations to explore the subject deeper. Introduce women artists through their work. Explore how the social status of women has changed over the years and influenced the work they created. Compare mediums used to create artwork and discuss the effect of the presentation of each medium. Students will choose an artist as an inspiration to create their own work. Why has the artists chosen their particular medium? What social/political/biographical facts have influenced the artist’s work? Thanks to Anna Efanova for her wonderful video about notable female artists throughout history and today. It is a perfect film for March, which is Women’s History month.